An IT industry analyst article published by Infostor. At Taneja Group we are seeing a major trend within IT to leverage server and server-side resources to the maximum extent possible. Servers themselves have become commodities, and dense memory, server-side flash, even compute power continue to become increasingly powerful and cost-friendly. Many datacenters already have a glut of CPU that will only increase with newer generations of faster, larger-cored chips, denser packaging and decreasing power requirements. Disparate solutions from in-memory databases (e.g. SAP HANA) to VMware’s NSX are taking advantage of this rich excess by separating out and moving functionality that used to reside in external devices (i.e. SANs and switches) up onto the server. Within storage we see two hot trends – hyperconvergence and software defined – getting most of the attention lately. But when we peel back the hype, we find that both are really enabled by this vastly increasing server power – in particular server resources like CPU, memory and flash are getting denser, cheaper and more powerful to the point where they are capable of hosting sophisticated storage processing capabilities directly. Where traditional arrays built on fully centralized, fully shared hardware might struggle with advanced storage functions at scale, server-side storage tends to scale functionality naturally with co-hosted application workloads. The move towards “server-siding” everything is so talked about that it seems inevitable that traditional physical array architectures are doomed. 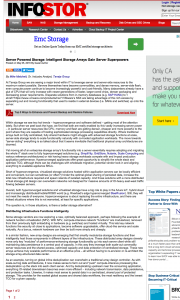 This entry was posted in Published Articles and tagged Infostor, Taneja Group by Mike. Bookmark the permalink.